Intex launched the Intex UDAY smartphone in India today. It sports a 5.2-inch HD IPS display. It is powered by the 1.3GHz Quad-Core processor with 3GB RAM and runs on Android 7.0 Nougat. It also comes with a Fingerprint sensor. The Intex UDAY also packs DataBack app, this helps in data saving and this app provides up to 500MB Free Data back to the users per month for Free. It also allows users to consume more to earn data back in their accounts. It has a 13 MP rear camera and a 5 MP front camera with LED flash on both the sides. Other applications on board include Prime Video, MiFon Security, Swiftkey keyboard application. With the focus on further strengthening hold in key regional markets, Intex is delighted to have partnered with 4 leading mobile retailers in the city. We are sure the group’s vast retail network in Pune city, business acumen and huge presence will have a rub-off effect in adjoining micro markets and will prove to be a game changer for Intex’s strength and efforts for consumer connect in Tier 2 & 3 markets. The mobile sports a 5.2-inch HD display with a resolution of 1280 x 720 pixels. The device comes with 3GB RAM and 32GB internalstorage, the internal storage memory can be expanded up to 128GB using microSD card. It has 13MP rear camera with LED flash and 5MP front-facing camera with LED flash. The device supports 4G VoLTE, Wi-Fi 802.11 b/g/n, Bluetooth 4.2, GPS + GLONASS. It has 3.5mm audio jack, FM Radio and Dual SIM. The mobile packs 2800mAh battery. 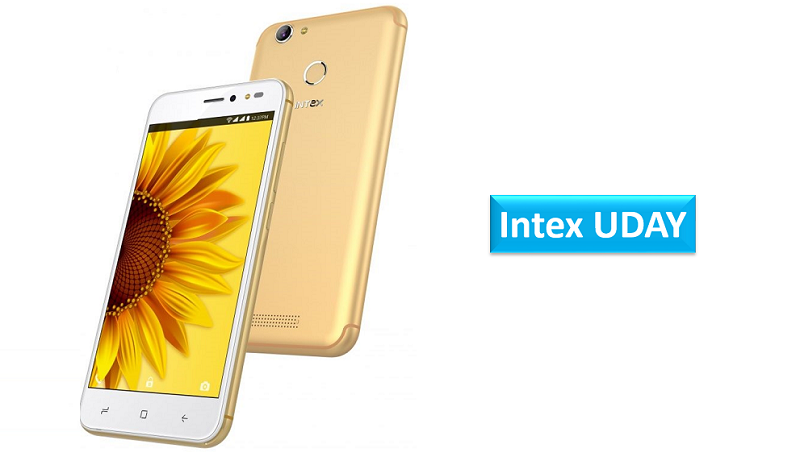 The Intex UDAY is priced at Rs. 7,999 and comes in three colors Black, Champagne, and Blue. It will be available exclusively through leading retail chains. Share us your views on Intex UDAY smartphone in the comments section below.